The Broken Wing Butterfly (BWB) strategy is a form of Butterfly Spread, but the distance from the body (the two Short At The Money Options) to the wings of the spread (the Long Out Of The Money Options) is not equidistant (as is the case with a conventional butterfly). A common setup for many Broken Wing Butterfly Spreads is to skip one Strike Price. 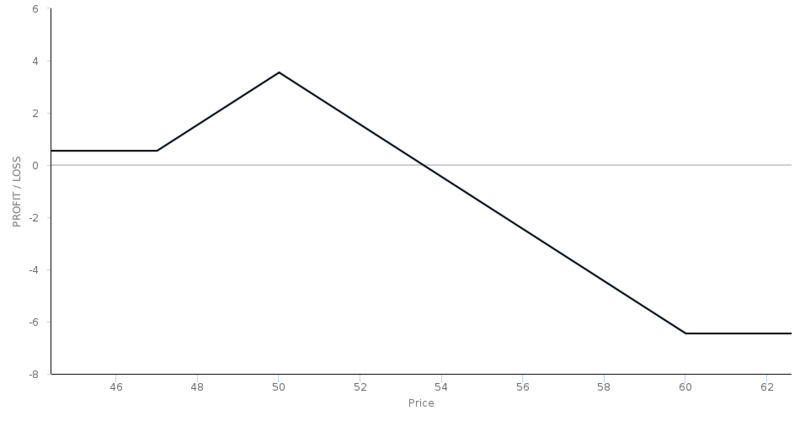 Broken Wing Butterfly Spreads have both defined risk and limited profit characteristics. They can be constructed with either call or put Options. BWBs may not require as many adjustments to prevent a loss being incurred. Should the price action move towards the more exposed side, however, the potential loss will be greater than a conventional Butterfly Spread. BWBs can sometimes be entered for a small credit (unlike conventional butterfly Spreads which are always debit trades). Usually this is only possible with Options that have longer to Expiration and/or high implied volatility. There are different ways to view BWBs in the context of other Options strategies, one is that they are like covered ratio Spreads since unlike these strategies, the maximum risk is defined. Another is that the trader is embedding a Short Call or put spread inside a Long Butterfly Spread. SMB Training video on trading Broken Wing Butterflies, including information on how to adjust them. Futures Magazine article by Alex Mendoza of RandomWalkTrading.com who coined the term 'Broken Wing Butterfly'. OptionAlpha.com guide on how to set up Broken Wing Butterfly (BWB) spreads. Article by Gavin McMaster on trading BWBs. TastyTrade.com explanation of Broken Wing Butterfly spreads. In-depth Dough.com article on Broken Wing Butterfly spreads. TastyTrade.com video explaining core concepts for a Broken Wing Butterfly spread. OptionAlpha.com video on adjusting Broken Wing Butterflies. OptionAlpha.com guide to Call Broken Wing Butterfly spreads.